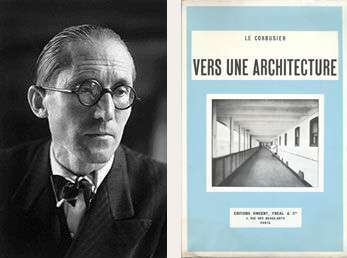 Le Corbusier’s and his book, "Vers Un Architecture (Towards a New Architecture)"
" A Great new epoch has begun. Industry, overwhelming us like a flood which rolls on toward its destined end, has furnished us with new tools adapted to this epoch, animated by the new spirit. Economic law unavoidable governs our acts and our thoughts. The problem of the house is a problem of the epoch. The equilibrium of society to-day depends upon it. Architecture has for its first duty, in this period of renewal, that of bringing about a revision of values, a revision of the constituent elements of the house. Mass-productions is based on analysis and experiment. Industry on the grand scale must occupy itself with building and establish the elements of the house on a mass-productions basis. We must create the mass-production spirit. The spirit of construction mass-production houses. If we eliminate from our hearts and minds all dead concepts in regard to the houses and look at the question from a critical and objective point of view, we shall arrive at the “House-Machin,” the mass-production house, healthy) and morally so too) and beautiful in the same way that working tools and instruments which accompany our existence are beautiful. Beautiful also with all the animation that the artist’s sensibility can add to severe and pure functioning elements." 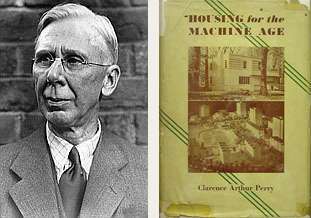 Clarence Arthur Perry and his book, "Housing for the Machine Age"
“In many respects airplanes, automobiles, ocean liners and railway cars, even though they move through space, are houses. Steel is now their basic material. If it is suitable for them, it would seem equally suitable for stationary houses. - Clarence Arthur Perry, Housing for the Machine Age, 1939. - Carl Strandlund, Architectural Forum, May 1949. - Senator Ralph Flanders, Architectural Forum, May 1949. We live in a machine age of prefabrication that we take for granted. Our cars, our clothes, electronics and other everyday products were created in assembly-line fashion. Prefabrication suits the American lifestyle; a quick manufacturing process which leads to high production and low cost. However, one of the most cherished products of our lives, our homes, are still manufactured traditionally. We expect to see the slow erection of a house, piece by piece, the daily process which results in one of our primary needs: shelter. Prefabrication of houses has been around since the Industrial Revolution. Cast iron prefabrication was introduced at the same time as the material itself. We see the benefits of this machine age productivity in our lives, yet we do not embrace it for our homes. Particularly in the United States, we refuse to take the chance to utilize other materials and means of mass-production in houses. 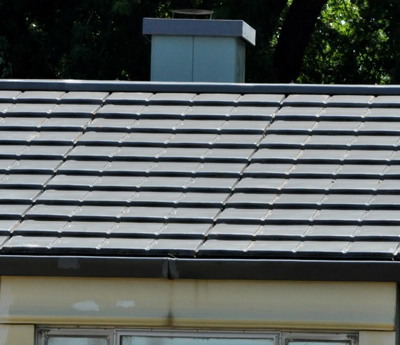 Many commercial buildings are created with “unusual” materials such as aluminum and steel. For the most part, our homes remain as our ancestors before us built, out of wood and paper, gypsum and stone. In the 1940’s, after World War II was over, America was faced with making new decisions about the way in which we live. The need was there, the time was right, and the public was eager. Enter Carl Strandlund and The Lustron Dream. 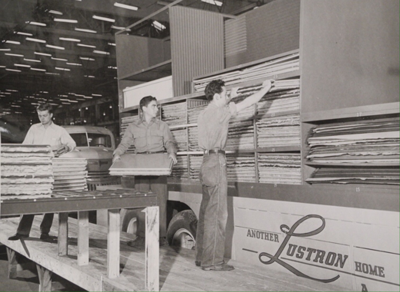 Lustron began as a response to crisis; a crisis finding its origins in the Great Depression and escalating throughout World War II. The housing market, along with most other markets, had come to a standstill during the Depression. 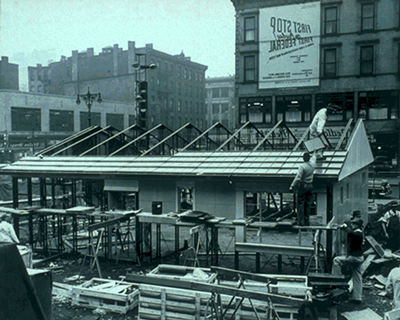 This era of non-production in housing continued during the war when there was no one to buy, no one to build and the materials used in such products were not available as they were needed for the war effort. This crisis came to a head at the end of the war when soldiers began to return home to girlfriends, wives, and families and now needed someplace to live. The housing crisis was on. There were five buyers for every one home on the market. To keep the situation from getting any worse, it was estimated that as many as three million houses needed to be built in 1946-47. In addition, the majority of the housing needs fell into the low-to-middle class; affordability was key. Lusterlite ad by Chicago Vitreous Corporation. 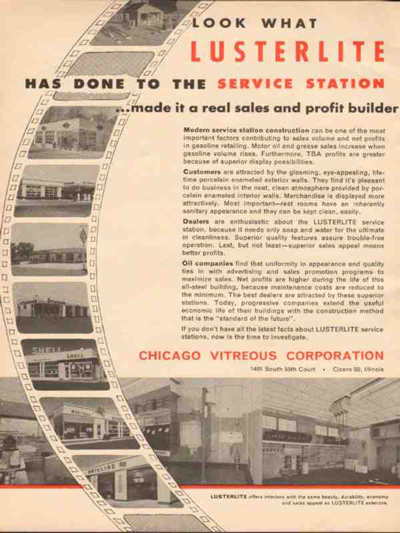 In the same year, 1946, Carl Gunnar Strandlund, vice-president and General Manager of the Chicago Vitreous Enamel Company, sold Standard Oil of Indiana on the idea of constructing 500 new stations across the Midwest with their product; porcelain enamel coated steel panels, a low maintenance, easily reproducible product. Standard Oil grabbed at the idea and sent Strandlund to Washington, D.C. to get the promise of steel shipments for the project. Strandlund admitted that he did not even know who his congressman was, but after spending some time in Washington, Strandlund was introduced to Wilson Wyatt. Mr. Wyatt could not sacrifice precious steel allotments for service stations, but instead saw an answer to his housing plan. 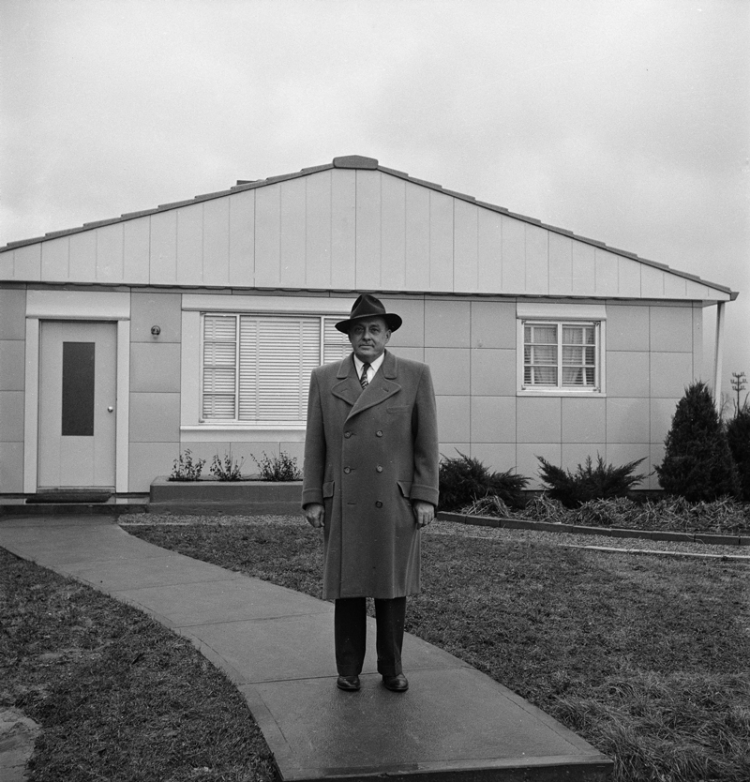 He told Strandlund that if he could manufacture a steel house, then he would get the materials. 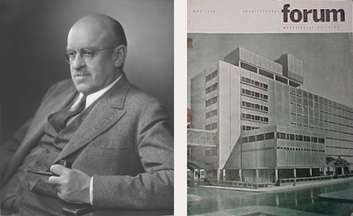 There is some speculation as to whether Strandlund had already thought of the idea of an all-steel home, or if Wilson Wyatt’s suggestion gave Strandlund the inspiration, but a few weeks later, Strandlund was back in Wyatt’s office with blueprints for the Lustron house designed by the architects Roy Blass and Morris Beckman of Wilmette, Illinois. 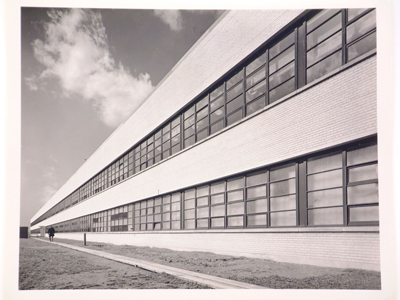 With a hearty approval from Wyatt who called Strandlund’s concept, “sensationally good,” Strandlund bought the manufacturing rights to the process for enameling steel parts from Chicago Vitreous Enamel in 1947 and formed the Lustron Corporation, naming himself president and CEO. With Wilson Wyatt’s backing, Carl Strandlund approached the Reconstruction Finance Corporation (RFC) for a loan of $32 to $52 million but was turned down as a bad risk, over which Wyatt quit in protest. 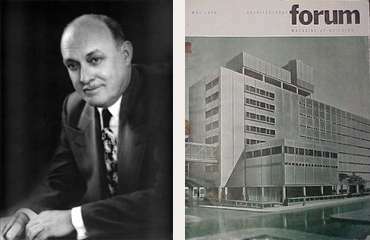 However, President Truman leaned on the RFC, the largest bank in the country under the auspices of the deferral government, who in turn agreed to load the Lustron Corporation 15.5 million dollars and leased the new company the wartime Curtiss-Wright aircraft plans in Columbus, Ohio, for $426,800 a year. The plan for the Lustron home was simple. 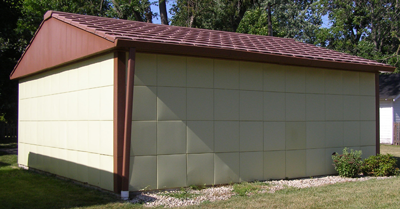 Built on a grid system, the porcelain enameled steel panels, both interior, and exterior, fit as modules onto a steel frame with rubber gaskets separating each panel. Every steel piece in the house, including the studs, gutter, window frames, doors, cabinets, and closets were coated with the same porcelain enamel finish, which rendered the pieces rust-proof in addition to making every bit of it, ‘…fireproof, rat-proof, decay-proof, and termite-proof. A house that would never fade, crack, or peel, never need painting, refinishing or reroofing…”. 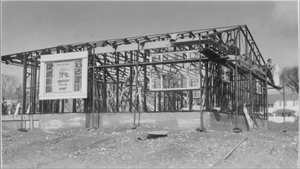 The house was roofed in steel trussed and covered by porcelain enameled steel “shingles.” Each house consisted of ten to eleven tons of steel. The only parts of the house that weren’t steel were the concrete slab on which the house was anchored, and the flooring, which was made of resilient asphalt tiles. 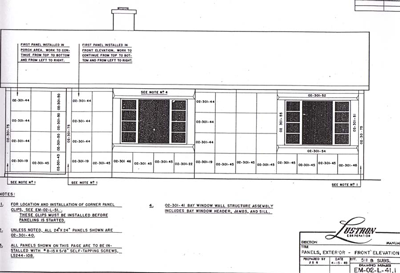 Page from the Lustron construction drawings showing panel locations. 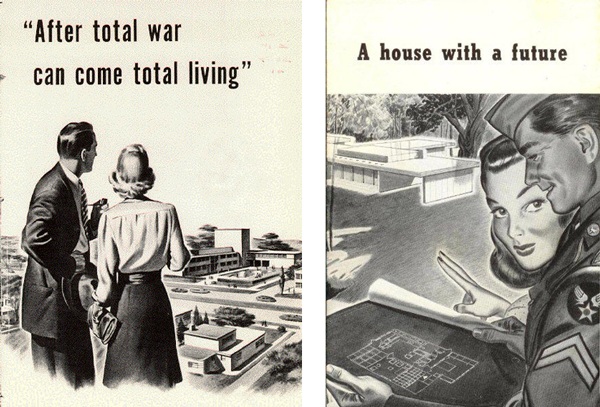 The houses came in several models, each with their own marketing name. The original and most widely sold model was the Westchester. 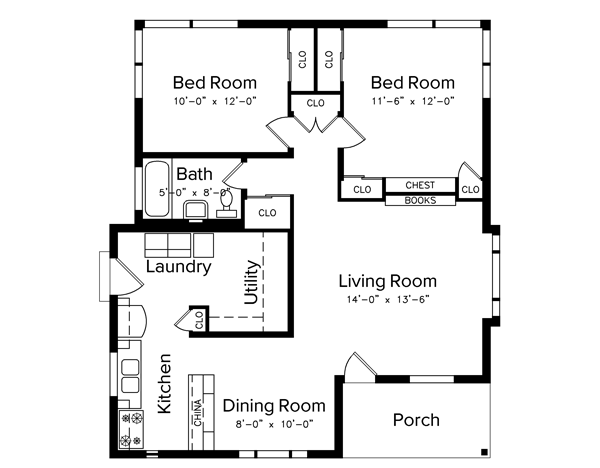 The two-bedroom model allowed for a cutaway porch on the front left corner with a distinctive steel truss column supporting the roof overhang. The three-bedroom model sacrificed this porch for the added room, and was entered under a steel canopy on the gable end of the building. 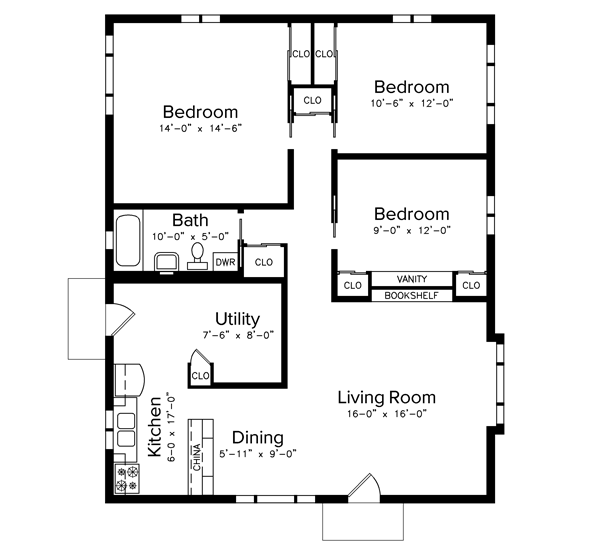 This model featured built-in amenities and a bay window. 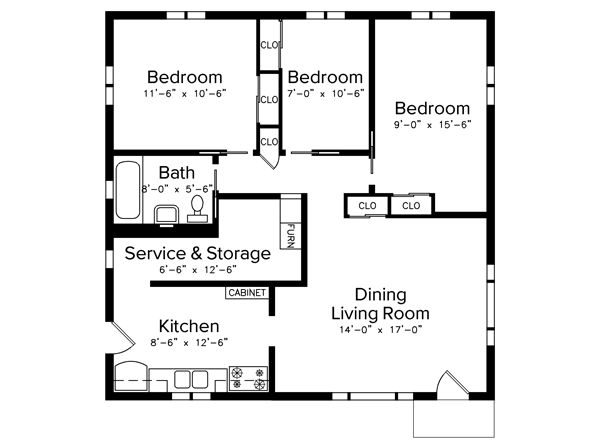 The second model type was the Newport, also available in both two- and three-bedroom plans. Similar in layout to the Westchester, it was slightly smaller in overall dimension. The third model was the Meadowbrook, slightly larger than the Newport, but not as extravagant as the Westchester. The Esquire model. Only one was ever built as this was the prototype model. 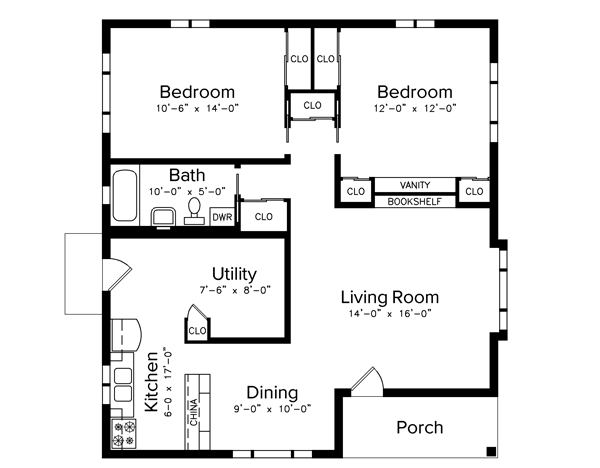 Tweaks were made to this plan to become the Westchester two-bedroom. 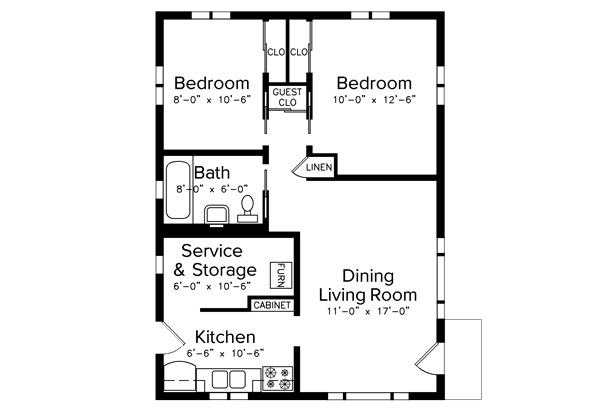 Some of the changes included eliminating the jog at the second bedroom, sliding and pocket doors replaced swinging doors as a space-saving measure, and the window pattern and types were modified. In the late 1940’s, two models of the Lustron garage were introduced, a one-car and a two-car plan. Shortly thereafter came the Lustron breezeway package, used to connect the house to the garage. There was even a choice of exterior colors for your Lustron home: Surf Blue, Maize Yellow, Dove Gray, and Desert Tan. Most interior rooms had either a light gray or baby blue paneling with the exception of the kitchen, bath and utility rooms which were yellow. Manufacturing such beauty, versatility, and function for the masses was no small feat. 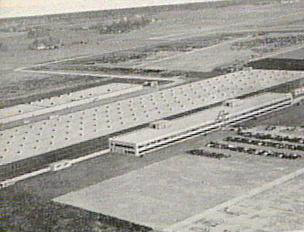 In came the Curtiss-Wright plant leased from the federal government; one of the two largest wartime plants in the United States. It was as long as twenty-three football fields and contained one million square feet of space. Eight miles worth of conveyor belts received steel from four railroad spurs and sent the material through 160 different presses. Roof shingles on the assembly line. Loading panels on a truck. 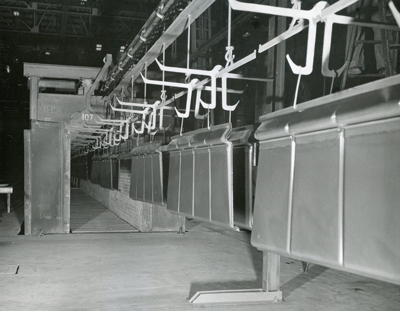 The machinery allowed for the production of fifty panels per minute which were then sent through various enamel dip tanks containing the six different colors (four exterior and two interior) and then run through large ovens which would bake the coating onto the steel. Steel studs were rolled out at a rate of 20 feet per minute. 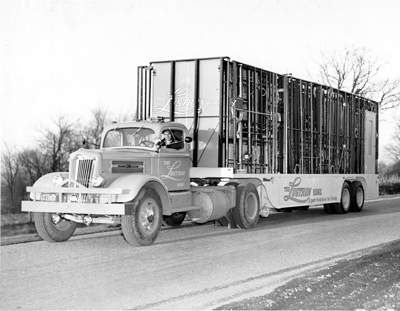 Some of the nearly 3,000 parts which complete a Lustron home (including hanging clips for the metal walls and a front door key), were preassembled and loaded on specially designed flatbed trucks which rolled through the plant one every seven minutes. Each piece was carefully loaded onto the truck in the opposite sequential order in which it would be removed from the truck at the building site. 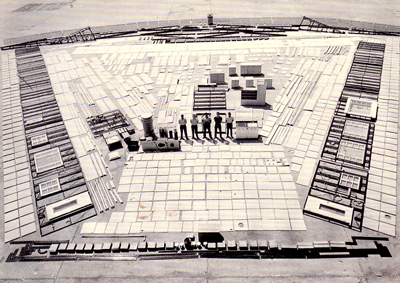 Each site was already equipped with a concrete slab previously poured to Lustron specifications. This degree of mechanization, assembly-line fashion, allowed the Lustron house to be priced lower than a standard home, at about $7,000 to $9.000 per home, excluding the price of land. In addition, it was predicted that it would take an experienced team less than 350 man-hours to assemble the home, as opposed to the 1600 hours it took to assemble conventional wood-frame homes. Lustron truly looked to be the answer to the housing crisis. Another unique idea about the Lustron house centered around how the homes were sold. 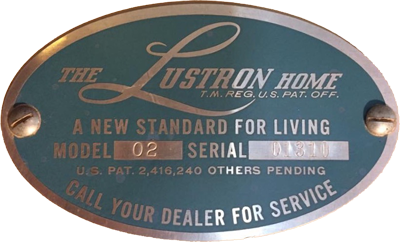 Created on an assembly line, the Lustron home bore a striking resemblance to the automobile industry, including the use of dealerships to market the product to the public. Each dealership was responsible for taking orders from clients in the area and would, in turn, deal directly with the plan to place the orders. The Lustron Corporation was even touted as the “General Motors of Housing.” Another striking similarity to the automobile was that the Lustron home came with an “Owner’s Manual” similar to cars, which instructed the new homeowner in general maintenance and care for such a unique product. Every Lustron home came emblazoned with a shield number for their house. Located in the utility room of the home, it was another reminder of the machine-age idea evident in the Lustron product. 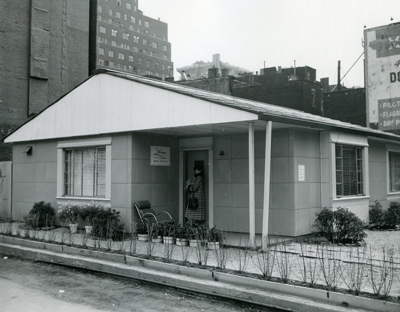 The Lustron corporation went into overdrive to market this new home type to the American public. 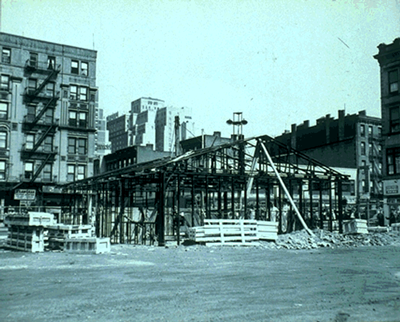 Worried about social rejection of an all steel house, demonstration homes were erected in 100 cities, including Milwaukee, Washington, D.C., and New York City where the model home was located right in mid-town Manhattan at the intersection of the Avenue of the Americas (6th Avenue) and 52nd Street mere blocks from Rockefeller Center and the Museum of Modern Art. These display homes were always crowded with onlookers interested to see such an unusual home. Some people would become enamored and would visit several times, intrigued by the modern conveniences of the Lustron. 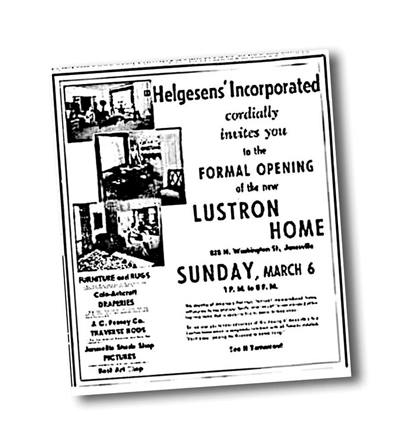 Newspaper advertisement for a Lustron open house. 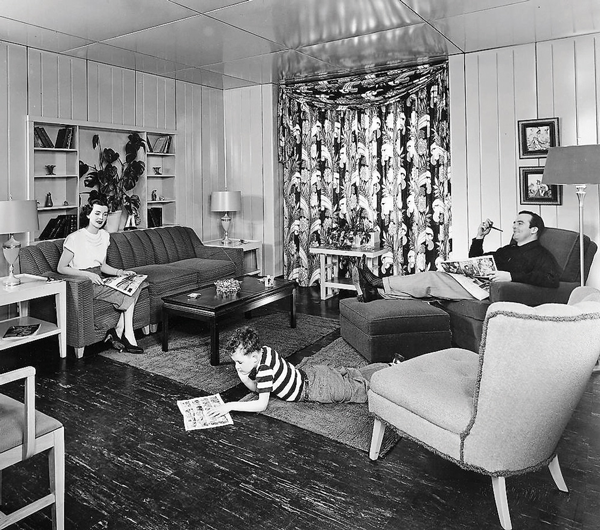 In July 1948, McCalls’s, a national women’s magazine, featured the Lustron home as the “Home of the Month” in which they furnished and decorated the New York display home. 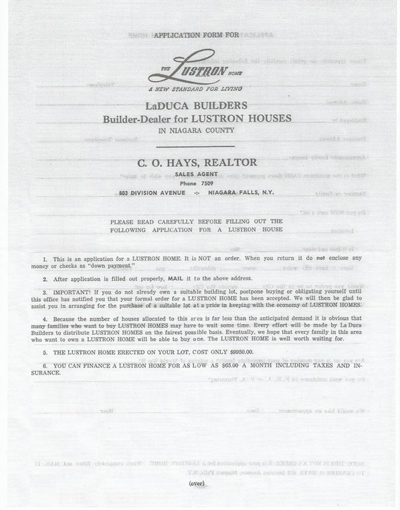 They featured the comments of many famous New Yorkers including homemaker Emily Post, opera star Gladys Swarthout and radio personalities Tex and Jinx all of whom had glowing comments to make about the Lustron home. 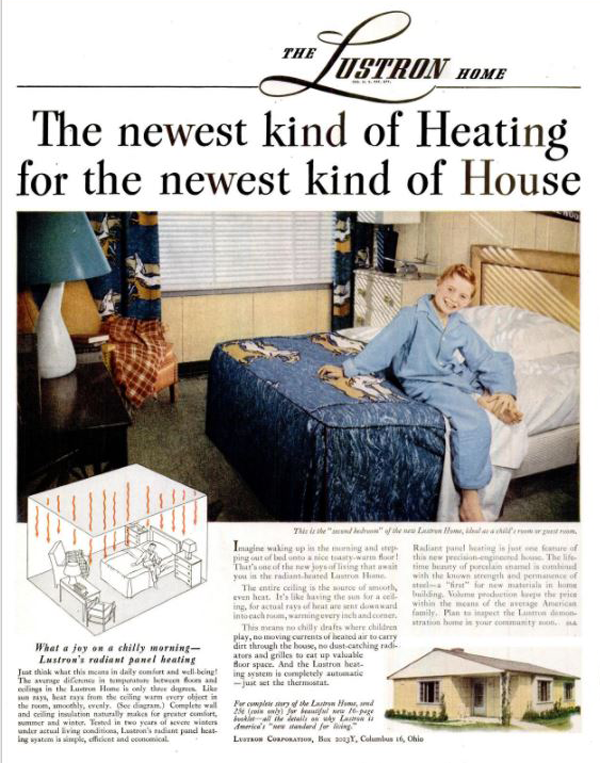 For those who could not visit the display homes across the country, Lustron also placed full-page ads in national magazines extolling the virtues of such a low maintenance house. 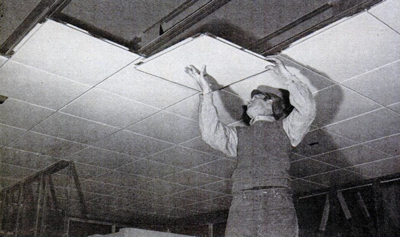 Even architectural magazines were giving the Lustron home positive reviews. 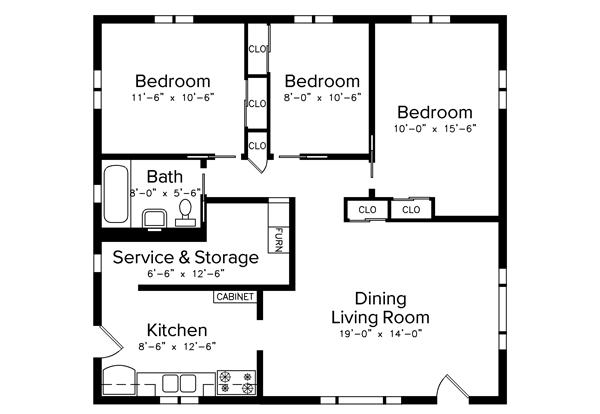 In 1949 Architectural Forum wrote, “…the Lustron house [has] enormous market appeal. Far from showing any dislike of the standardization of a machine-made house, well-heeled customers [are] talking to the houses with something like the passion Americans have given to automobiles.” By the close of 1948, the Lustron books showed orders for 20,000 houses. Many times, the houses themselves were the best advertisement for the product. The Lustron was a modern house full of machine-age conveniences once only dreamed about by American housewives. The porcelain enamel coating was low maintenance. No painting necessary, water and mild detergent was all that was needed to clean the walls. To maximize wall space, all of the doors inside the Lustron house were pocket doors and built-in units separating the kitchen/dining, and living room/bedroom spaces were hailed as exceptional ideas for utilizing space. Every kitchen came equipped with a space-age machine, the Thor Automagic, which converted from a dishwasher to clothes washer with minimal effort. The heating system was also a unique forced hot air system which ran through the ceiling and radiated down to the rooms below. 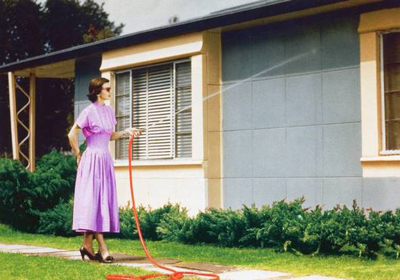 The Lustron House was marketed as a homemaker’s dream, and so it seemed to all that visited. 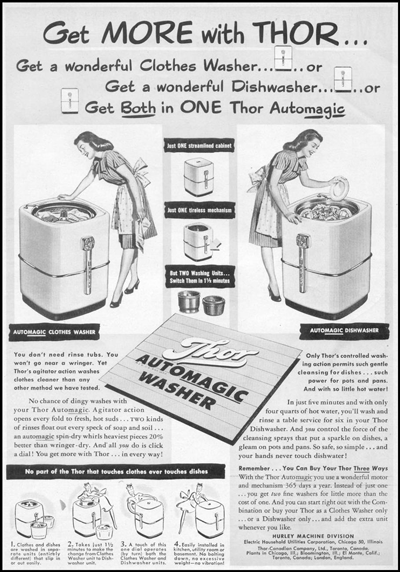 The Thor AutoMagic – A clothes washer and dish washer in one!